“Baby, it’s cold outside.” Does that mean you’re stuck by the fire until the spring thaw? Heck, no! The winter is a beautiful time of year to get out and explore the outside world. But it’s also a time when the terrain can be so treacherous that it seems like it’s out to get you. Fortunately, you aren’t the first to walk this path, and you won’t be the last. Many people enjoy a good winter hike, and they’ll come back unscathed with the right hiking and safety tips. 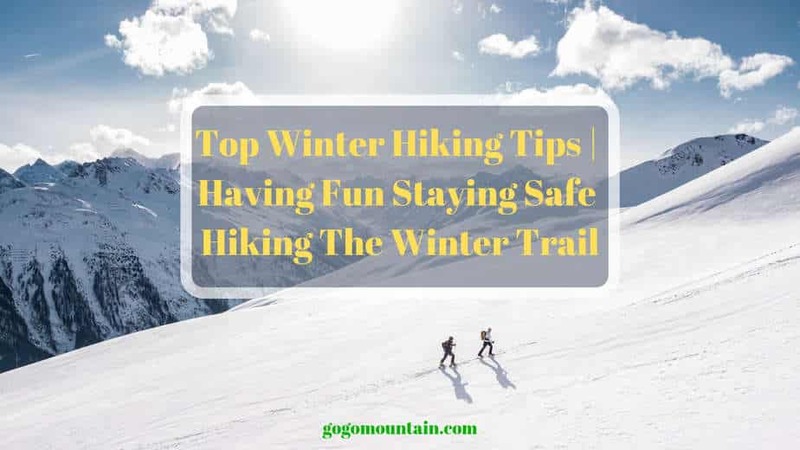 If your just taking up Hiking, or more specifically ‘Winter Hiking’ then bookmark this post as we are delving deep and giving you a ton of great Winter Hiking tips, having fun while staying safe and warm and lots more. When snow blankets the earth, everything seems to be covered with a sense of peace. The snow itself buffers sound, which helps contribute to the warm and fuzzy feelings of serenity. And as you look around, you see light dancing off the trees as tiny beads of ice reflect the sun. There’s a reason for the term “winter wonderland.” This experience is nothing short of wondrous. Can you get the same vibes from stepping out in your backyard? Probably not. In order to truly understand the beauty of nature in the winter time, you’ve got to trek out beyond the reach of any vehicles or man-made structures. In other words, take a hike! You’ll also get all the benefits of hiking that you’d see any other time of year. Keep yourself in hiking shape year round when you make a habit of hiking in the winter. 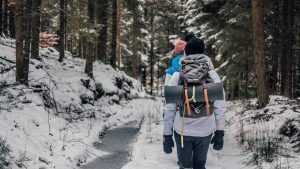 But with all the many benefits of winter hiking, you’ll need to practice some extra safety measures to keep you safe from the cold and dangerous ground conditions. Here are some tips for staying safe and warm on the hiking trail. Anyone who is active outdoors in the winter months (looking at you, runners) can tell you that you may sweat – even when the temps drop near freezing. Naturally, this will depend on the intensity of the hike, your body’s propensity for sweating and the clothes you’re wearing. So you’ll want to be smart about the layers you choose. You don’t want something that’ll retain moisture and potentially freeze. But you’ll want to resist the urge to overdo it on the cool-weather gear. You don’t want to dress so warmly that you’re going to sweat. Whenever you sweat on a winter hike, you risk hypothermia, so be careful not to layer on too many articles. Your body will naturally warm up when you start moving, so if you’re already fairly warm when you step out the door, you’re wearing too much. If you start to sweat on the trail, reduce your speed or take a break. You can also adjust your body temperature by removing your hat and/or gloves temporarily. Keep a close watch on your moisture levels to avoid a risk of hypothermia. You may or may not need every layer we’re about to recommend, but use your judgement based on the climate and conditions. In addition to layers, there are some winter gear items that are basically essential for cold-weather hikes. Can you hike without them? Probably. Will you epically wipeout multiple times? Most likely. So let’s look at the gear you’re most likely to need on a winter hike. If you’re going to be hiking in the winter, traction aids are a must. You never know when you could encounter slick footing, and it’s not always obvious beforehand. During any hike, you should expect to traverse across various types of terrain, and any bit of it could be icy. Traction aids (like YakTrax or Kahtoola Spikes) can be very helpful in snowy or icy conditions. These will help you gain footing when the ground is slippery. Snowshoes can also help you gain traction in snowier conditions. If it’s especially icy, consider using Crampons. 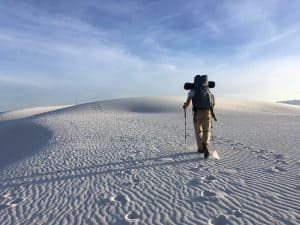 Even if you don’t normally use a hiking stick or trekking pole, you’ll want to consider using one for your winter hikes. If you’re starting to lose footing, you can use your trekking pole to help rebalance and avoid a potentially disastrous fall. If you’re using snowshoes, you’ll definitely want to use trekking poles. But you don’t need snowshoes for these to be helpful. Ever step knee-deep into a snowbank you thought was going to be ankle high? Gaiters can help keep snow out of your boots and off your legs, which will work wonders for your warmth. Make sure your gaiters are water-repellant and go above the calf. The shorter ones are meant for desert conditions and won’t help you in the snow. Oh, did you think you we were going to let you hike out into the cold without an adequate supply of food? Never. It’s always important to bring snacks on a hike, but it’s especially important during winter hikes. You don’t want to let your blood sugar drop as you’re ascending the mountain. In the winter, your body needs about twice the amount of calories it typically needs because it’s burning more calories to stay warm. For the best energy boost, pack snacks that are high in protein. And be sure you’re packing snacks you can eat on-the-go. You may stop for a picnic on a summer hike, but that’s not advisable in the cooler months. Whenever you stop, your muscles will need time to warm back up again. We tend to think more about hydration in the warmer weather, but it’s equally important during winter hikes. Even if you don’t seem to be sweating much, you’ll need to replenish moisture. Even if your body isn’t signaling that it’s thirsty, you need to replenish moisture. When your body is cold, it decreases the amount of blood it sends to your periphery in a process called vasoconstriction. This works to keep your core nice and warm, and it’s why those digits feel like they’re going to fall off when temps get frigid. But vasoconstriction can trick the body into thinking it’s well hydrated because there’s an abundance of blood surrounding your vital organs. This is why the brain is unlikely to send thirst signals when you’re cold. But it doesn’t mean you’re actually well-hydrated. If it’s especially cold, keep the bottle of water insulated. If you don’t have a bottle insulator, you can use wool socks or a beanie to wrap it up. And if at all possible, boil your water before a hike. It’ll stay warm for most of your hike and you won’t have to worry about it freezing. The downside to staying hydrated in the winter is that you’ll have to make more frequent stops. The line from your Camelback would most likely freeze up, so you’ll have to dig for your water bottle. Still, it’s important enough to make the effort. Dehydration can leave you more susceptible to hypothermia, so keep drinking. Hiking on a sunny winter day may seem like paradise, but winter hiking at night can be downright frigid and uncomfortable. Try to plan your hike for the sunniest time of day (this should also be the warmest). If you’re a fan of watching the sunset on a hike, you can still accomplish the milestone, but make sure you’re doing it from a spot near the trailhead. Temperatures will drop significantly when the sun disappears behind the mountains, and you don’t want to have a long way to go when this happens. Hypothermia is a real concern for winter hiking, so it would be naïve to ignore it completely. If you take all the appropriate safety measures and wear the right layers, you can probably avoid this danger, but you should at least know the signs. Your body reaches a state of hypothermia when its core temperature decreases so low that muscular and cerebral functions become impaired. Hypothermia can affect your cognitive abilities and your ability to get back to safety. This is why it’s important to understand this danger thoroughly. When your body is in a state of hypothermia, it may already be too late to get help on your own. If you or anyone in your group is showing these signs, get help right away. The important part is to get that person to a warm place as soon as possible. If your friend is showing signs of hypothermia, you may be tempted to massage or rub the person to warm them up. Avoid this urge as it can cause the person to go into cardiac arrest. In the same vein, do not apply any type of direct heat to your friend. Instead, approach them gently and attempt to lead them to a warmer place. Do not delay in getting medical help. This is a serious and potentially fatal condition. The best way to handle hypothermia is to avoid it altogether. If you’re hiking with a group, talk about the importance of remaining warm and dry. Let everyone know that they should communicate with the group leader in the event that they get too sweaty or wet. In this case, they may be able to mitigate the wetness or head back to safety before symptoms of hypothermia set in. An ounce of prevention is worth a pound of cure, as they say. If this is your first time on a winter hike, you’re in for a real treat. There’s nothing more serene than being alone with nature in a snow blanked forest. And if you’re a seasoned pro, you know this to be true. But either way, arrive prepared to stay safe and enjoy the view.